From the car park at the end of Limetree walk, follow the bridle path down on to the beach and passed the rocks known as St Baldred’s cradle. Follow the beach along Ravensheugh and Peffer Sands until you reach the Beggar’s cap rocks. From here climb up to the fields above the beach and head for Seacliff. 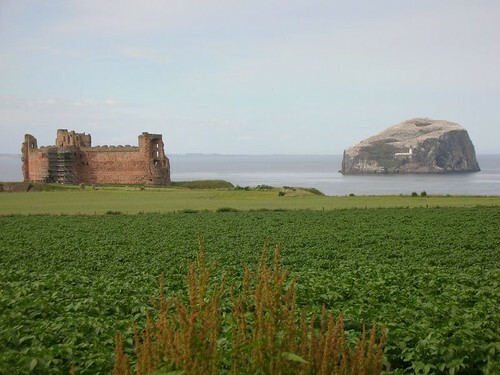 Follow the path out of the estate to Auldhame and then the A198 to the car park at Tantallon castle. I had Jamie my son with me for the next couple of days. The weather was good and we had good fun walking to Tantallon castle. When we returned on our bikes to the start of the walk, we met a young guy about 18 who was almost finished walking around the coast of the UK. His name was Louis and he was a week away from finishing the walk which must have taken him about a year to complete. Imagine at 18 having finished a walk around the whole of the UK. Probably about 4000 miles I would imagine. His web site is at http://www.louiswalkstheuk.tk. You are currently browsing the Scottish Coastal Walk blog archives for the day Monday, July 4th, 2005.